LaClare, E. (2011). Enhancing user identification with the Independent Learning Centre at Sung Bin Home for Girls. Studies in Self-Access Learning Journal, 2(4), 304-308. The Independent Learning Centre at Sung Bin Home for Girls is a language and life skills learning environment for girls between the ages of 8 and 18 who reside at Sung Bin Orphanage in Gwangju, South Korea. Although initially learners exhibited a great deal of enthusiasm for the centre, over time interest faded to the extent that many ceased to be regular users. This article describes the efforts of volunteers and orphanage staff to revive interest through a community art project intended to enhance learner identification with the centre. In addition to highlighting the importance of collaboration among stakeholders, the article asserts that undertakings of the type described here should be seen as part of an on-going process of maintaining engagement. In early 2009 a group of volunteer language teachers began making preparations for the establishment of a self-access learning environment at a girls’ orphanage in Gwangju, South Korea. This was not the first time such an endeavour had been undertaken. A similar effort had been made several years prior though a variety of problems had forced its closure after only a few months of operation. While factors such as a lack of manpower and insufficient learner instruction undoubtedly played a role, we honed in on the problem that we believed to be the most salient, namely a lack of stakeholder involvement in the process of establishing and managing the centre. From the original decision to create the centre through to the details of its execution, everything had been decided by the volunteers and the director of the orphanage. Neither the learners nor the orphanage staff had been consulted at any stage. This above all else, we concluded, was responsible for the centre’s failure. In contrast to the unilateral approach that characterized the initial effort, our second attempt sought to create opportunities for input from potential users as well as (though to a lesser extent) the staff of Sung Bin Orphanage. In many ways the conditions were ideal for maximizing learner involvement. The centre was to be located within the orphanage complex itself, which ensured easy access. Furthermore, the number of users was not too great (around 60), and their involvement with the centre could continue for upwards of ten years. These last two factors in particular have been identified by Aston (1993) as being especially important in enabling learner involvement. From early on we made a point of consulting learners on decisions relating to all aspects of the centre. One of the more memorable examples of this was a session conducted by one of our volunteers in which learners were asked to draw pictures of how they imagined the centre might look. Although we were obliged to disregard the more imaginative efforts (those that included swimming pools and billiard tables), several themes emerged that assisted us in selecting the furniture and colour scheme. In terms of learning resources, measures were taken to ensure that the centre was appropriately stocked with items of interest and relevance to the learners. A local EFL bookseller was persuaded to open his shop to groups of learners for the purpose of exploring and selecting resources. Although limitations of time and space meant that not every learner was able to participate in this process, most seemed satisfied with the choices made by their peers. With the construction complete and the resources purchased, we officially opened the doors of the Independent Learning Centre at Sung Bin Home for Girls in March of 2009. Because so much effort had been expended in soliciting input during the early stages of the project, it was generally (and perhaps naively) assumed that sustaining learner interest and involvement in the centre over the long term would be a matter of course. While it is true that the centre benefited from an initial flurry of enthusiasm from the learners, after less than half-a-year it became clear that interest was on the wane. Records of the number of users as well as the frequency and duration of their visits revealed a steady downward trend. Informal interviews confirmed that while at first the learners had been curious and excited about the centre this feeling had diminished over time. Interviewees were asked what could be done to renew their interest in the centre, however, no concrete suggestions emerged. Considerable discussion revolved around the plight of the centre and what could be done to turn the situation around. A number of solutions were proposed, but the most intriguing was that of a community art project, namely a mural, that would reinvigorate learners and volunteers alike. A theme that emerged from the subsequent planning sessions was that the project should not be a “one-off” enterprise but rather the first step in an on-going process aimed at maintaining engagement and enhancing learner identification with the centre. To this end, a project implementation cycle (Figure 1) was devised based on a model created by Henderson, Ahmed, Shafeeqa, Jauhary and Smith (2006). The project implementation cycle seemed to address our primary goal of re-engagement through collaboration between users and volunteers. Furthermore, since the cycle was, by design, self-renewing we hoped to reverse the trend that had claimed a large percentage of the centre’s users. It is important to point out here that complacency and low motivation were experienced in equal (if not greater) measure by the Sung Bin staff and volunteers. Decreasing interest among the learners left many questioning if running the centre was worth the effort involved. Thankfully, the mural project provided a much needed boost of enthusiasm. In addition to the excitement generated by the project itself, the implementation cycle included awareness raising activities the benefits of which were two-fold. First, the attention of local news media provided validation for those who had worked so hard for so long to make the centre a reality. Second, the publicity brought in a fresh group of volunteers whose ideas and energy would prove instrumental in the months to come. Although factors such as the proximity of our users and the duration of their involvement with the centre have been, in the main, tremendous advantages, they have also given rise to challenges perhaps not faced by other self-access facilities. It is taken for granted that learners will experience periods of low motivation at one time or another. However, in the case of the Independent Learning Centre at Sung Bin Home for Girls, all too often these periods co-occur or spread from one learner to the next with frightening speed. No doubt this can be attributed to the fact the learners live together and study together and influence each other in ways not easily accounted for by those tasked with operating a self-access centre. Going into the mural project we knew better than to expect miracles, but our hope was that the enthusiasm flourishing among the volunteers and staff would spread to the learners. Thankfully it did, and for the six-week lifecycle of the project there was an atmosphere of genuine joy. The creation of the mural was a true collaboration with the learners taking part in every step of the process. We were careful to ensure that their voices were heard throughout and that they featured prominently in the accompanying awareness raising campaign. During various debriefing sessions, it was clear that in the minds of most of the volunteers our goal of re-engaging the learners had been accomplished. This sentiment was borne out in the centre’s attendance figures, which rose sharply over the ensuing weeks and months. That said, it remained a matter of concern among the volunteers that the centre continue to attract users following the completion of the mural project. It was in this respect that the project implementation cycle proved especially useful by helping us to channel the positive energy created by the mural into discussions about future schemes. We were particularly keen to undertake projects that would both engage the learners and enrich the centre’s resources. One such endeavour was the construction of a puppet theatre and marionettes to be used in English skits and role-plays. Gardner and Miller (1999) have drawn attention to the benefits of learners becoming producers of language-learning materials, and while the age and proficiency of our learners seriously diminishes the practicality of this, projects such as the puppet theatre address the ultimate goal of enhancing identification with the self-access centre by allowing learners to exert a measure of control over the environment. In a self-access centre such as ours at Sung Bin Girls’ Orphanage, with its residential dimension and reliance on volunteer labour, there is a constant risk that the SAC might come to be seen as a burden or an imposition in the eyes of the stakeholders. As such, managing the centre involves managing the atmosphere to ensure that it remains a place of wonder, excitement, change and improvement. In our case, achieving this would not have been possible without a fundamental shift in the way we looked at the centre. Regarding it as a process rather than a product allowed us to address and eventually reverse the declining participation observed over a period of months following the centre’s opening. Experience has convinced me that a management ethos which remains closed to the idea of collaborative evolution leaves its learners on the outside and inhibits identification with the self-access centre. Elton LaClare is currently a lecturer at Sojo University in Kumamoto, Japan. Previously Elton taught at Chosun University and Gwangju National University of Education. For seven years Elton served as a volunteer teacher at Sung Bin Girls’ Orphanage during which he helped to establish the orphanage’s self-access centre. Aston, G. (1993). The learner’s contribution to the self-access centre, ELT Journal, 47(3), 219-227. Gardner, D., & Miller, L. (1999) Establishing self-access: From theory to practice. Cambridge: Cambridge University Press. Henderson, R., Ahmed, Z., Shafeeqa, F., Jauhary, A., & Smith, J. (2006). 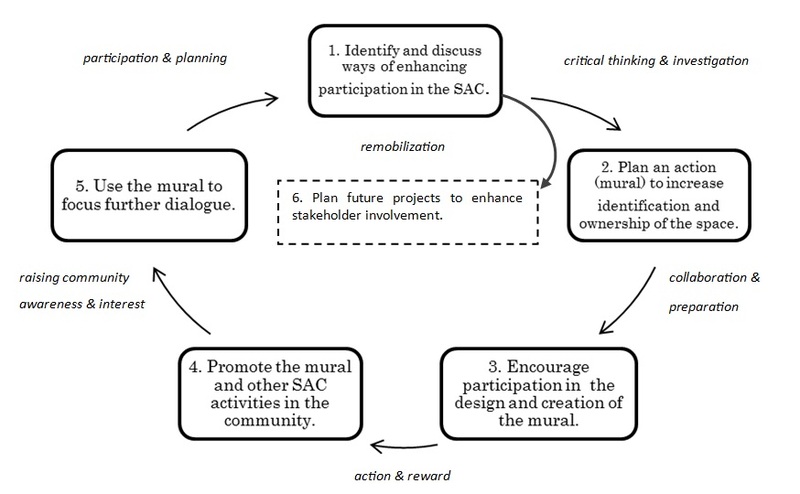 Community mural: A facilitator’s guide to mobilising community environmental action. Male: Live & Learn Environmental Education.